"Powerful philosophical intellects, as that of Anaxagoras and Descartes, capable physicists, such as Lord Kelvin, Huygens, Fresnel, not to mention other major ones, have tried to explain by means of a fluid's motions respectively astronomical, atomical, electrical and optical phenomena, without however arriving at discovering their inner laws", thus Marco Todeschini (Bergamo, 1899 - 1988) referred to the dense net of attempts made by great thinkers of the past to unify physical phenomena as manifestations of etheric states, in his monumental Theory of appearances - Space-dynamics and Psychobiophysics of 1949, consacrating his entire life to the research of this purpose. Already in ancient times, Plato with his chora, and Aristotle with his hyle, moved in this same direction. Also in the physics of Descartes, the fine substance that composed the skies held such decisive functions. Even Newton, famous for his objections to Descartes' approach, will manifest later in his Opticks a lack of certainty in regard to the ether's theories, which is more surprising if one compares these last considerations with the apodeictic procedure of the Principia, so as to let us feel the sensation of kind of an indirect conversion to the ether's theory, in the new Quaestiones, added to the last editions of his work. An attempt to establish a link between electrical, magnetic and optical phenomena starting from an etheric point of view, in antithesis with the concept of an action at a distance, was made by Faraday. Elaborating about the Oersted's discovery of the deviation experienced by a magnetic needle in proximity of a current, and the famous Arago's experience, in which a current passing in a plane covered with iron filings causes a displacement of these in concentric circles, Faraday came to the conclusion that the ether was the medium through which electromagnetic forces propagated, thus reviving the old scholastic law affirming that "Matter cannot act in places where it does not exist". The discovery of electromagnetic induction and of the simmetry between electrical and magnetic effects was fundamental for the theoretical developments of Maxwell first and then of Lord Kelvin. They (as well as many others, such as J. J. Thomson) built mechanical models for the ether, and applied them with a certain success; in particular, Lord Kelvin theorized an atom vortex. His theory was merely a part of a wider whole, having the characteristics of considering in some cases the ether as a fluid, and its vortices as the magnetic field. We thus arrive to our days, to the todeschinian Space-dynamics, the tip of an iceberg of a surprisingly thick spider's web under the shadow of the official physics, connecting many brains which try, autonomously, to find a "visionary" alternative - to use a todeschinian word - to the preponderance of the "illusionist" today's science. In synthesis, these alternative theories represent magnetism as an ether's current, which moves in the space from one point to another. Using the electron as a micro-vortex of the ether, we can explain the magnetic field produced by an electrical current: the electron flux within the conductor would move with the spin's axis parallel to the direction of the motion, creating in such a way a "mega-vortex" of ether around the conductor. 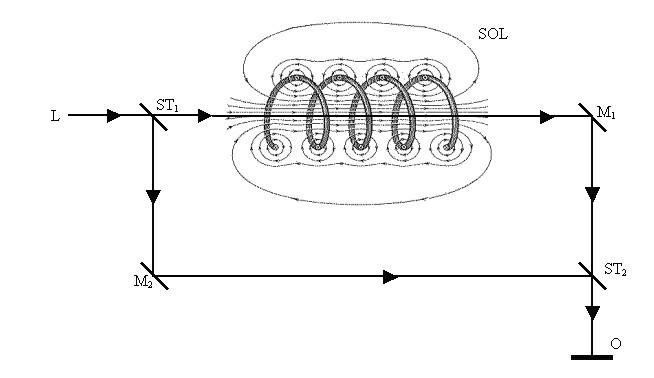 In the case of a solenoid the combination of the vortices around each coil creates on its interior a continual ether flux parallel to the solenoid's axis. Our suggestion simply consists in verifying, with a laser-beam passing through the solenoid, the possible speed's variation of the beam (or of the transit time), which would be dragged or slackened according to the verse of the electrical current (and thus of the ether flux or of any of its complex states). Being hypothetically possible to continuously vary as desired the intensity of the magnetic field, and then to possibly vary in a continuous way the speed of the luminous beam - and even to surpass the value c - here it is that this experiment could be able to give a new confirm, or to put new doubts, about the validity of the theory of relativity. The following examples are meant as simple guidelines for further experimental elaborations. It is opportune to use, for some of these, in place of a continuous current, an alternate one, in order to give major evidence to possible variations of the effects. It is not to be totally excluded also the possibility of positive results of experimentations using electrical field in place of the magnetic ones. 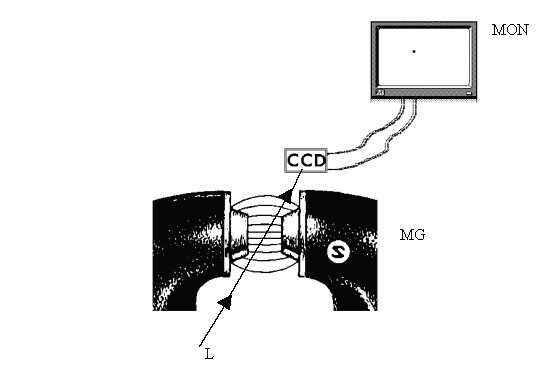 CCD: CCD sensor or analogous; K: Kerr's cell; F: photomoltiplicator or photosensor; TOR: toroidal coil; OF: winding of n spire of an optical fibre. If one does not make use of a device different from a Kerr's cell, the luminous beam should be polarized since the beginning, making it for instance reflect on the surface of a semi-silvered glass plate. Furthermore, because of a possible new polarization assumed by the luminous beam at the interior of the solenoid, it would be better to find in any case an alternative to the Kerr's cell. The required effects could be increased by making the luminous beam pass more than once inside the solenoids. We could even think (with some caution) to make use of a wave-like guideline, for instance an optical fibre, in place of the mirrors, with the aim of increase the path of the luminous beam.